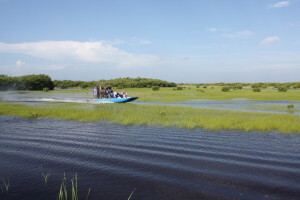 Taking an airboat tour from Everglades city Fl. After driving down us 41 for an hour we arrived at our destination. The sign out front says Captain Mitch airboat tours.After paying the captain called our name and we loaded on the boat with another family of four. As we leave the dock on our Everglades airboat ride we are soon flying across the grass jungles of the Everglades. The captain slows after a while and steers the boat straight into the saw grass toward some mangroves and a palm tree. He points out an alligator nest, a mound of grass and twigs about three feet high, behind the saw grass and under a scrub palm. He tells us the female built this nest several months ago, during our winter months, when the water was low and the land was dry. Our captain tells us that a female alligator can lay up to 40 eggs at a time. She then covers her eggs with more vegetation and the sun warms the nest to help the eggs hatch. But the survival rate for young alligators is very slim. They are easy prey for birds and larger alligators, all except their own mother, of course. The captain says it will be luck if three survive to adulthood. We take off again and I wonder how this captain knows his way. The airboat trails and mangroves all seem very similar to me. It’s like a maze. But the captain is sitting higher than we are and I notice a radio tower in the distance which I figure is his landmark. The breeze feels so cool and refreshing as the captain weaves through the sloughs. He slows again and directs our attention to a small pool on the right. We see something swimming in the water. It looks like a snake, but our captain tells us it’s an anhinga, also called the snake bird because it often swims with its body entirely underwater, its head and long neck gliding on the surface of the water as it hunts for fish. The anhinga is also an expert diver, explains our captain, like the loon. It can disappear instantly and noiselessly, swim a long distance and reappear in the opposite direction. It’s a member of the duck family but has the ability to perch and nest high in trees. It sleeps standing erect; even during a pouring rain it will stand in an erect position with its neck and head stretched straight up, standing perfectly motionless, so the water can glide off. Nature is amazing. The captain starts up the engine and we continue our trek. Ahead, perched high on a cypress tree, we see a Great Blue Heron. Easy to spot with his long legs and s-shaped neck. He’s easy to identify with his blue gray color. The captain says he is on the lookout for his next meal: either a frog, small fish, salamander, lizard, snake or crayfish will do. Their nests are commonly found on channel markers, trees and even radio towers, near water. Our journey continues and our hour is nearly up so we head back. We see several graceful egrets in flight and a hawk, seeming to hover in the sky, weaving back and forth, no doubt in search of a meal. Then we see it. A brown pelican, easy to identify with with his long bill and pouch. This one is flapping his wings just slightly above the water., working hard for his food, not begging at the Naples Pier. The captain slows the boat and we follow him a little while Then the pelican plunges into the water to captures a fish, his pouch serving as a sort of fish net. A different method, but most effective for this animal. We enjoy the ride back to the dock, enjoying the last few minutes of the wind in our faces. The captain thanks us for joining him on the ride and invites us to go into the gift shop to hold a baby alligator, get some refreshments and check out the souvenirs, including an assortment of books about the Everglades and it’s birds. We know we will come back for another airboat ride. Soon.